It’s the festive season and on Thursday morning, Minister of Education, Dr. Nicolette Henry joined the students of President’s College for a Christmas Breakfast. During her engagement, the students were given an opportunity to have one-on-one interactions with the Minister, who noted her satisfaction with the discipline displayed. In a brief address to the school, Minister Henry announced that the financial provision for the dietary needs of the school has increased significantly in the 2019 budget. 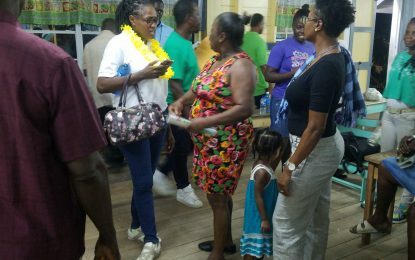 “It is important to this government that our children are given healthy meals, and that is why we will continue to improve in this area,” she stated. The Minister noted that if students are providing a healthy meal they will be better positioned to learn. She reiterated the government’s commitment to further improving the education system, with the allocation of huge sums in the 2019 budget. Thereby ensuring Guyanese children have access to a quality education. At the end of the short visit, the students serenaded Minister Henry with Christmas carols and thanked her for taking the time out to visit them.